Go ahead, bookmark this page, add it to your Pocket or do whatever you want so you can navigate back here easily. Success on Instagram comes down to a few different factors. Your content, of course, needs to be very attractive and engaging. Not just that but you’ll also need to consider using quality hashtags that will increase your reach and engagement. 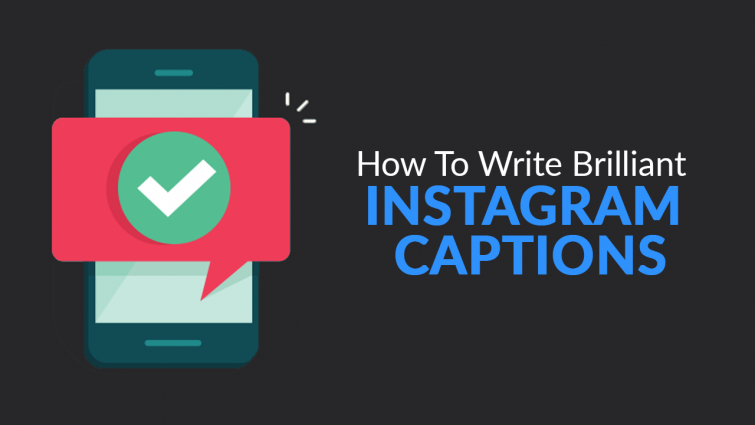 Instagram captions are vital when it comes to sharing content on the platform. 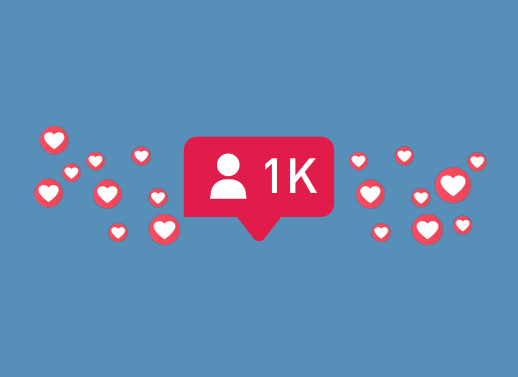 Having a caption that encourages users to take action will not only help increase engagement, but your post will also be noticed by more people. The Instagram algorithm favours content that gets a lot of engagement. It focuses on posts that have a lot of comments more than the number of likes it receives, and usually within a short space of time since publishing. 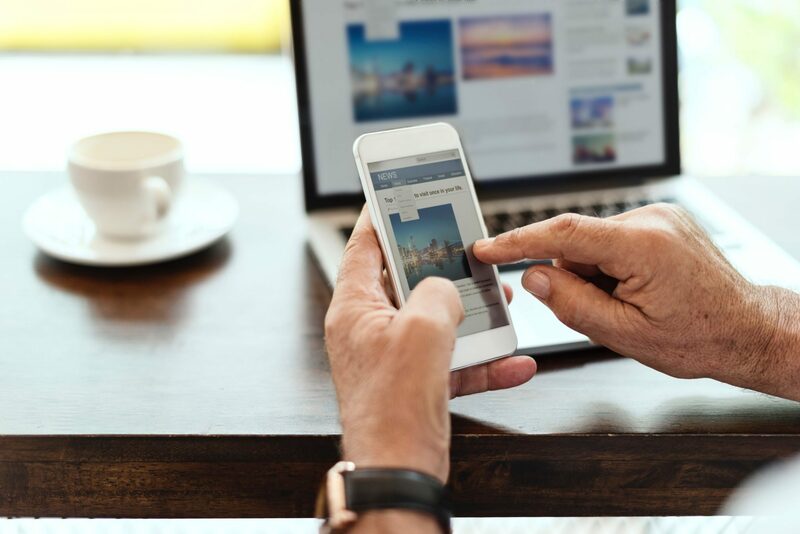 By providing instructions and encouraging your audience to take action, it’s possible to generate more traffic, sales and conversations from the platform. 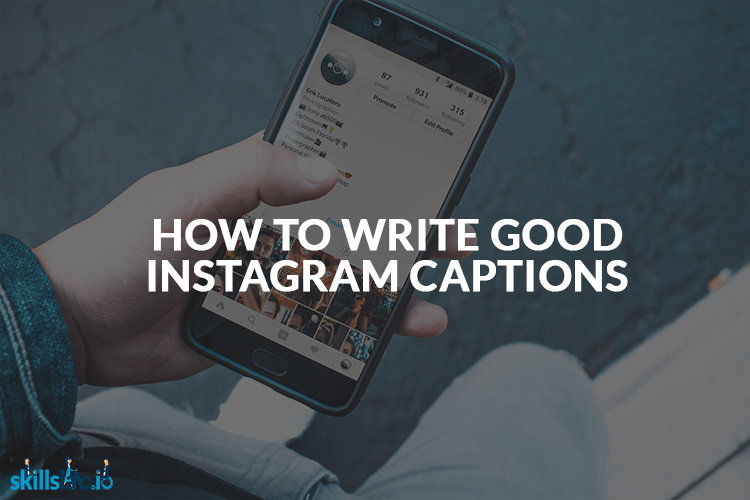 Writing a good Instagram caption isn’t as hard it might seem. It does require some thinking and a clear striking message, however. Depending on the goal of the post, you should think about what you want them to do. Think about what your competitors have tried. Did it work for them? If not, why? If it did, what did they do differently to others? Writing a good Instagram caption comes down to a few elements. Your call to action needs to be clear and precise. You should consider mentioning other accounts where appropriate, and lastly, you should only use a few key hashtags in the caption, the rest should be placed in the comments. Now we’ve covered that, let’s dive deeper. When it comes to call to actions, you aren’t exactly limited, except for the fact you can’t add a clickable link in the caption itself. 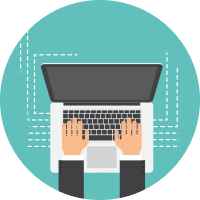 However, there are many ways you can create a striking call to action that actually works. Whether you’re wanting your audience to tag others in the post, visit a website, comment on something specific related to the post etc, it can all be achieved. When creating a call to action for your Instagram caption, consider using emojis, they sometimes make the message more powerful and definitely eye-catching adding some colour. 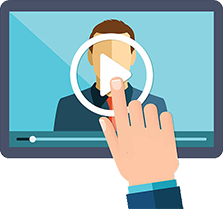 Here are a few examples of call to actions and how you can make them a success. This usually works well on content that is very creative and eye-catching. Something different that the norm. This can be a little tough, especially since Instagram doesn’t allow clickable links in the captions. Instead, you’ll need to be creative. You could direct your users to your profile and click the link in the bio, or, maybe purchase a short domain. Create a funky memorable URL with that domain that you could display in the caption or on the image itself. 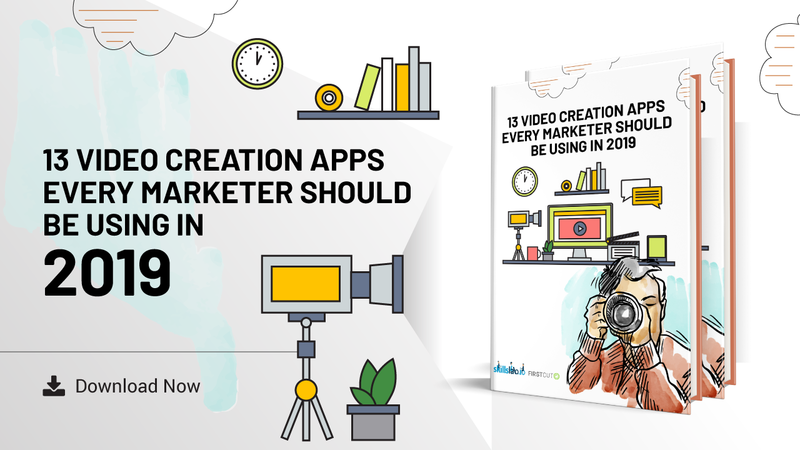 For example, at Creation Agency, the short URL is https://we.creat/e/ followed by a particular word or few. This a fairly easy call to action and works the majority of the time providing the content is decent. Simply saying something along the lines of “Double tap if you agree!” can give you great success for quotes and other content. That’s just a couple of call to actions you could try out. Get creative and don’t be afraid to experiment with your marketing. Tagging other accounts in your Instagram caption can help massively. However, don’t just go mentioning random accounts or for no reason. You should mention accounts that are in the same niche as you, influencers that you are quoting from or a caption that relates to another user in a positive way. For example, if you’re a company that’s organising a charity fun day or hosting an event, you could mention that charity’s Instagram handle. Or if you’re partnering up with an influencer, you could mention them. When it comes to using hashtags, you should be strategic about where to place them. 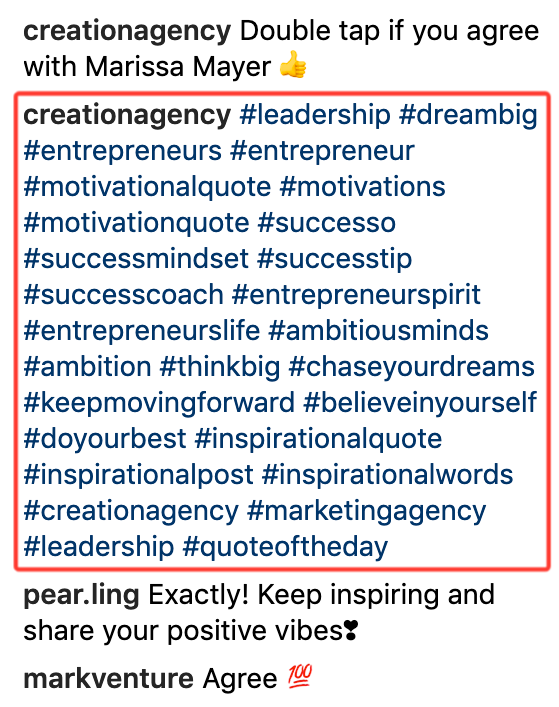 If you’re using more than 10 hashtags, it may look a little ‘spammy’ if they were all placed within the caption itself. Whilst you could use dots and other symbols to space them out, it still doesn’t look as great. However, what you can do is place hashtags in the comment section. If you choose to do this, you must have the hashtags copied to your clipboard ready to paste as soon as your post is live – this will then allow your content to appear in the hashtag search providing your account is public. If you’ve been given the opportunity to partner with a brand through a sponsored or endorsed Instagram post or you’re working with an influencer who you’ve approached for a partnership, the influencer will need to mention it in the caption. This is required to comply with the FTC guidelines. 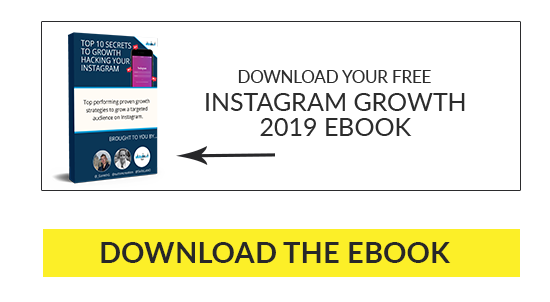 It’s common practice that all influencers disclose an Instagram sponsored post by placing either #sponsored, #spon, #ad, #paid, #partnership or a similar type of hashtag in their caption. However, not all of those will be accepted by the FTC. You must use either #ad or #sponsored in the caption. For more information on the best practices of disclosing a sponsored post, see below the Do’s and Don’ts infographic created by FTC.